Dispatch time 1-2 days - this bike is assembled in our workshop before dispatch. Minor assembly required on arrival, details supplied with bike. Our best-selling Onza trials bike, the Ska has great components throughout and a vibrant paint scheme. 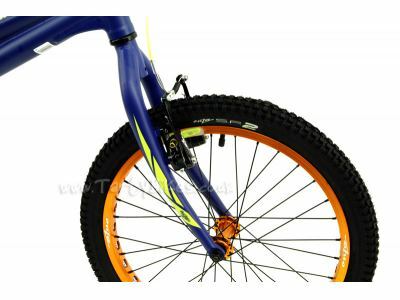 19" rear wheel with a larger tyre for extra grip! 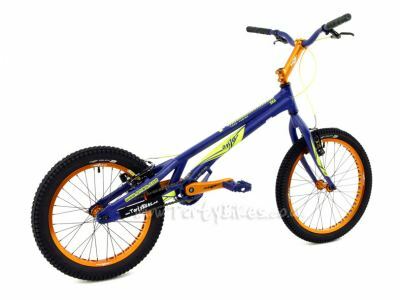 - Excellent value 20" wheel trials bike from Onza with a 19" rear wheel, ideal for beginner or fast learning riders. 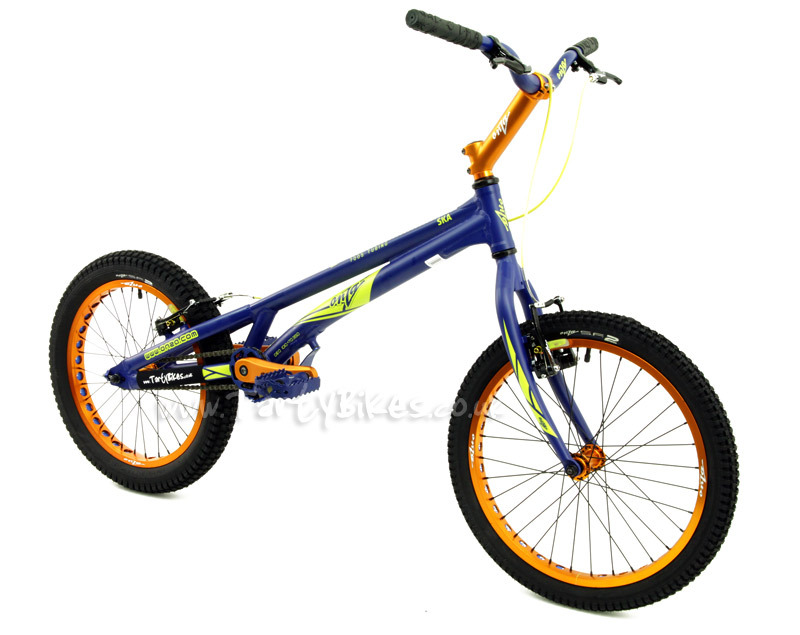 - High grade 7005-T6 aluminium frame with head tube reinforcing gussets. - Tough Onza cromoly forks. - Both frame and fork are fitted with 4-Bolt mounts and V-Brake adaptors, making it easy to upgrade to hydraulic rim brakes in future if you wish. - Powerful Onza DD 'V' brake at the front and rear are fitted with upgraded sticky V-Brake Pads, offering great stopping power! - Drilled light weight single wall rim at the front reduces weight while the drilled 19" rear rim is double walled for extra strength and durability. - Fitted with Onza's new Sticky Fingers 2 tyres, 20 x 2.0" front and 19 x 2.5" rear. - Onza crankset fitted with a 30-engagement front freewheel and Comp-style bashring, with a 12t fixed sprocket on the rear wheel giving the ideal gear ratio for 20" bikes. - Bash/ski-plate fitted as standard. 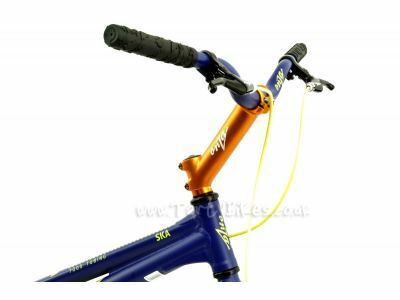 - Onza cromo riser 31.8mm trials handlebar. - Onza alloy 31.8mm stem to reduce weight. - New Onza caged pedals. - Seatless design saves weight and increases stand over clearance. 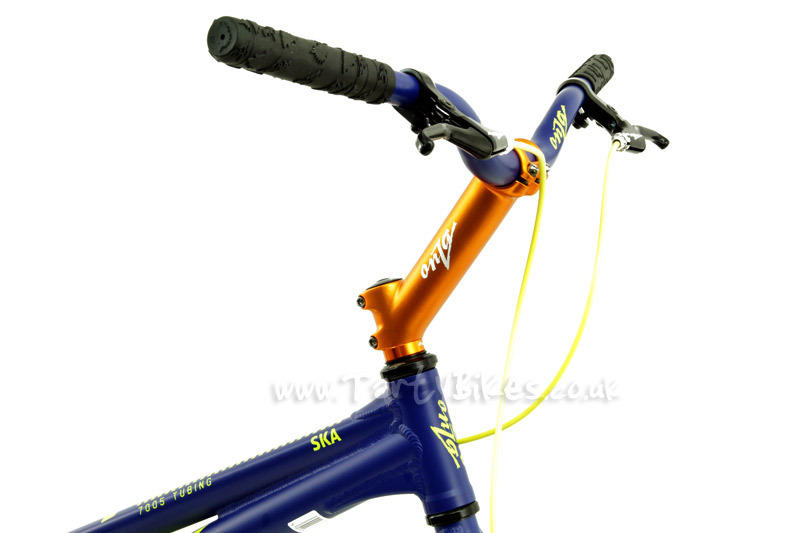 - Satin blue finish with orange and yellow accents. All bikes may feature small marks in the paintwork or small marks in the finish of other components - this does not affect your warranty. Hi there, I’m 21 and about 5ft5” and looking st starting trials , what wheel size and frame size would you recommend ? Don’t really know what I’m looking for...Many thanks in advance! For your height, a 20" or 24" bike would be the best fit straight out of the box. A 26" bike could work, although you may find that you need to use a slightly shorter stem to reduce the length of the front end of the bike. For getting into trials, a 20" wheel size is generally ideal as the smaller size helps make the bike a bit more agile and maneuverable. That said, if you have more experience riding mountain bikes or other bikes that use a large wheel size, you may find a 24" or 26" bike will feel a little more at home. As before though, a 20" bike will be great for getting the basics dialed in - something like the Onza Ska or the Echo Lite would be a good option. With it's new, lower price the Ska gives you a lot of bike for your money, and likewise the Echo Lite offers great value for money too with some nice upgrades over the Ska. If you'd like more help choosing a bike, or have any other questions, feel free to ask. Our stock system on our website is 'Live', so if a product is showing a green 'Add to basket' button on the page then it's available in our warehouse. The only thing to note is that if you're hoping to come in to pick a bike up we'll need some notice of this - we build each bike up, check it thoroughly then set it up before it leaves us, which will take some time to do. Hi,I have three questions. 1. Is 13 to old to start trials 2.Is this bike suitable for a kid like me at 6 ft and if not what would suit me 3.Is 20 a good option for absolute newbies to trials like me. 1. 13 definitely isn't too old to start trials! We have customers who are getting into trials in their 50's and 60's, so 13 is absolutely fine. Plenty of top riders have got into trials later than 13, so don't worry about it. 2. If you're 6ft then you're towards the top end of what we'd recommend for the Ska, but luckily the Ska is relatively roomy compared to some of our other 20" bikes so you shouldn't have any issues. If it felt a little small, changing the stem from the standard model to a 180mm Trialtech Race Forged or Jitsie Forged Stem would help give a little more space for you. 3. A 20" isn't a necessity for new riders, but they do make learning the basics a little easier. That said, if you have a background that means you are more used to bigger wheels (e.g. 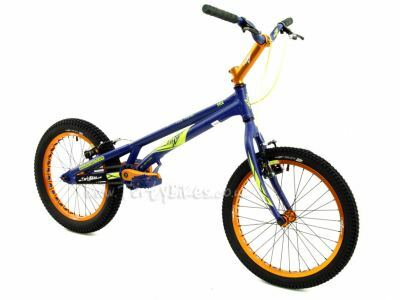 if you do a lot of mountain biking) then going for a 24" or 26" wheeled bike might make the transition to trials easier. 20" trials bikes feel very different to other bikes so it can be a big step to make from a mountain bike, whereas a 26" trials bike like the Echo Pure would feel a little more natural. This isn't a hard and fast rule though - we know of riders who ride mountain bikes regularly and prefer a 20" trials bike, and similarly riders who ride BMX and prefer 26" trials bikes. It should give you a good idea of how best to start off though. Overall, the Ska is a great bike to start off on. The Onza range were designed with beginners in mind so they're good to learn the basics on, but still have the potential to do more advanced moves. With the currently reduced price of the Ska it's even better value for money too. can you fit a free wheel drive on the rear wheel? Which parts would I need to replace the brakes on this bike with the HS33 Hydraulic Rim brakes? Thanks! Hello, can people who’re over 1.55 ride this bike? I am about 6 feet 2 inches tall and close to 190 pounds will this bike work for me? Hey there! I would like to buy the model ''Onza ska''... How much (euros) will it cost??? Will this bike still be available for purchase in the summer of 2018? Is the size of the rear drop outs 110mm x 14mm? Hi - It's 110 x 10mm. Thanks! 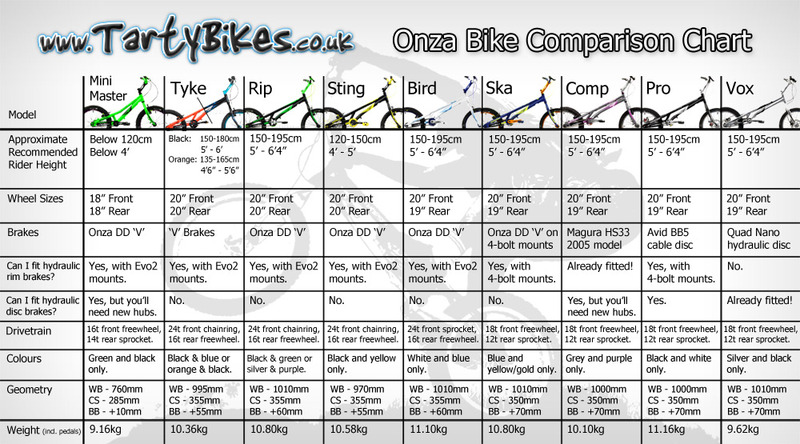 How much harder is it to start of and learn the basics on a 24" bike like the ONZA zoot compared to a 20" bike like the ONZA ska, or is it about the same difficulty? Do you get a chain stay when ordering this bike and about how often do you have to change break pads? what is the chain size? 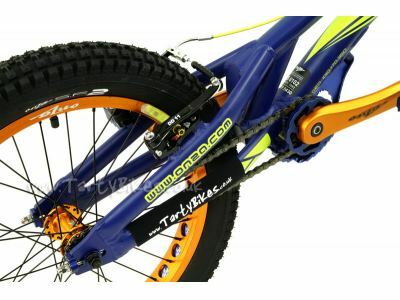 Hello tartybikes , which type of brake gives a better bite on an 20 inch bike a disk or an rim brake??? Thank you, Tharun Shiv. Hello tartybikes if we grind the rims will it decrease the srength of the wheel and how many grinds can a wheel take??? Thank you , Tharun Shiv. 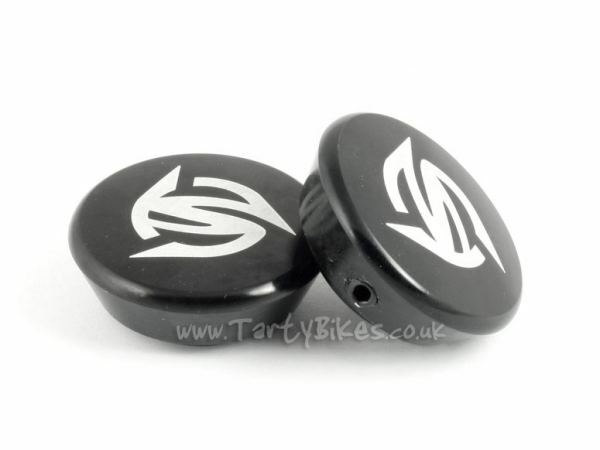 Hello tartybikes i wanted to know that do we need spaners to tighten the wheels or an allen key??? And if we need to use a spanner what will the size be??? Thank you , Tharun Shiv. Hello tartybikes I just wanted to ask do get an owners manual with the bike ??? Can this bike be shipped to India??? what's the difference between this bike and the onza rip? 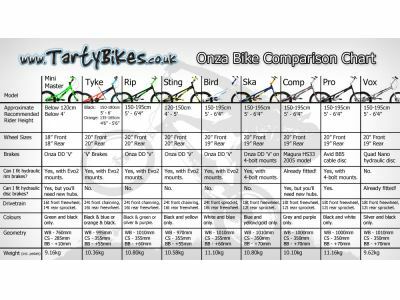 also I have never ridden a trial bike and am 5"9 so which bike should I get, the rip or the ska? Hi Murray - thanks for your question. The two bikes will feel quite similar as most of the difference lies in upgradability. The 19" rear wheel of the Ska has more trials-specific tyres available to it than the 20" of the Rip, and whilst they both use vee brakes, the Rip frame/fork only has vee brake mounts, where the Ska has 4-bolt mounts and then uses vee brake adaptors. This means it is easier to mount hydraulic rim brakes in the future if you decide to. The drivetrain is all of a higher quality, and the freewheel is mounted to the crank rather than the wheel. This improves ground clearance and evens out the weight distribution a little more. There are many small differences like this that a beginner may not notice the difference between and both are suitable for your height, so it's more down to your budget, and if you view the future-proofing as being worth the money or not! Hope that helps. Thanks, Flipp. Hi i am wondering if the onza ska would be a good bike for me. I am about 5 foot 3 and i have looked into alot of bikes but they have a "requimended" hight and all that! (Sorry if everyone is asking you this) but i am wondering about this bike!! Hi Auzzi - thanks for your question. This bike would fit you just fine. At your height, any of the "full sized" 20" bikes would be about right for you, though if you feel they are a bit too big, simply rolling the handlebars backwards a little will help make it feel a touch smaller. Hope that helps! Thanks, Flipp. I am about 6'3 and weigh about 210 lb. would I be able to ride this bike. Hi William - thanks for your question. At that height you might feel a little cramped on a 20" bike. You would likely be more comfortable on a 24" or 26" bike. Thanks, Flipp. is it possible to fit a gyro (detangler) system on this bike? Hi Danny - thanks for your question. You would be able to fit one of the style that is several plates that sit below the stem (like this one: http://www.odysseybmx.com/dailyword/archivesV2/1985/01/gyro-g3.jpg) but you could not fit the more modern BMX style that affixes by bolting two tabs to the side of the headtube (like this one: http://cdn.bmx-forum.com/4/49/600x450px-49545229_gryoon2.jpeg). Hope that helps. Thanks, Flipp. What kind of Brake level blade spare chould i replese it with? Hi Thomas - thanks for your question. Unfortunately you cannot replace just the blade as it is fixed into the body, though any of the Cable Pull Levers we stock will work perfectly with this bike. Hope that helps. Thanks, Flipp. Hi Anton - thanks for your question. Yes, you can fit HS11 brakes to this bike though you would need to use 4-bolt brake clamps and remove the 4-bolt to v-brake adaptors. At that height you may find this bike a little small. Most people over 180cm tend to be more comfortable on a 26" bike. Hope that helps. Thanks, Flipp. What do you recommend onza bird or onza ska. Hi James - thanks for your question. The Bird offers a lot of bike for your money, but the Ska is more upgradeable if you think you are going to want to make changes in the future. The Ska features a 19" rear wheel, 4-bolt mounts for hydraulic brakes and a front freewheel system that are all improvements over the Bird, but is more expensive as a result. Hope that helps. Thanks, Flipp. Can u pedal backwards on this bike? Hi Aj - thanks for your question. 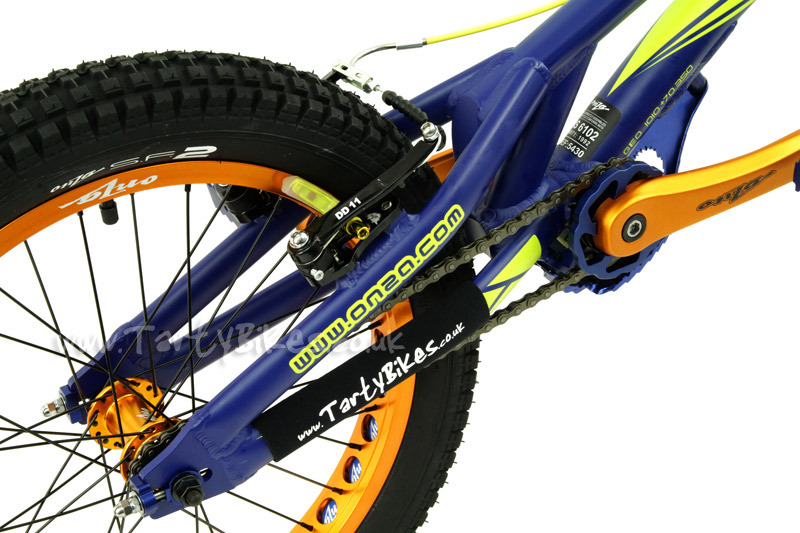 Trials bikes use a freewheel or freehub mechanism, meaning that if you pedal backwards, you will not move backwards. If you are rolling backwards you will have to pedal backwards to allow the movement to continue, and if you are rolling forwards you can stop pedalling and continue moving forwards. Hope that helps. Thanks, Flipp. Hi Sam - thanks for your question. This would be a great bike for you to get started on. It is a great bike as it comes, but it also very easily upgradeable should you decide to do so in the future. Hope that helps. Thanks, Flipp. 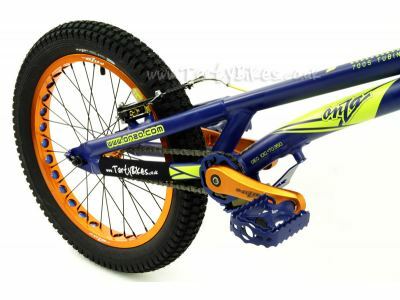 Hi Toby - anywhere from around 5' (150cm) upwards would be fine on this bike! Thanks, Flipp. Hi Alex - thanks for your question. Just go for whatever you find comfortable, or helps you ride the most. Some people run very soft tyres and some very hard. It's a matter of personal preference in how you want the bike to handle, though it's worth noting that running very soft tyres makes you a little more susceptible to pinch punctures. Hope that helps! Thanks, Flipp. Does this bike fit to me, I am 1.6m?.I want to start with trails(beginner) . the brakes on this bike are they hard to push? Hi Guy - thanks for your question. To calculate your shipping costs, add your items to the basket and go to the checkout. Entering your address will let you see what postage options are available to you and their relative costs without committing you to the order. The postage itself is a next day service so will arrive with you the day after we send it. The time it takes us to send it out depends on our workshop schedule. It could leave the same day as you place the order if we do not have many bikes to set up, but it could be as long as 4-5 working days in particularly busy periods. Hope that helps. Thanks, Flipp. Hi Ruben - thanks for your question. You will be absolutely fine on a Ska at that height. Thanks, Flipp. Which bike do you think i should get. This is my first trials bike and i just want to play around with it. Hi Noah - the Ska is a great choice for a first bike. A lot of people tend to go for the cheaper models as they are not sure they want to spend so much money on a bike, but if you have the money, it gets you quite a lot more bike. This model has a 19" rear wheel and four-bolt brake mounts, meaning as and when you want to upgrade your bike, most parts will fit straight on to the frame, rather than you being stuck with relatively little choice in 20" wheels or vee-brakes. That being said, the bikes are quite good to start with, so it would likely be quite a long time before you want/need to upgrade it anyway. Hope that helps. Thanks, Flipp. Hi Noah - thanks for your question. Yes, this is the only colour that these bikes are made in. Thanks, Flipp. Can You ship to America? Hi Mason - we can and regularly do ship to America. All our postage information is available here: http://www.tartybikes.co.uk/pages/postage.html and if you would like to find out how much it will be, simply add the items you would like to your basket and go to the checkout. You can check through the order details without committing to purchase. Thanks, Flipp. RE Onza Ska. I would like to set the bike up for a smaller rider. Would it be possible / advisable to fit a shorter stem, if so what would you recommend (I'm trying to reduce the "stretch" distance to the bars)? Also, is it possible to reduce the bar width - say an 1" off each side? Finally, are the brake levers span adjustable? Any other advise on this would be helpful. Thanks in advance. Hi Graham - thanks for your queries. 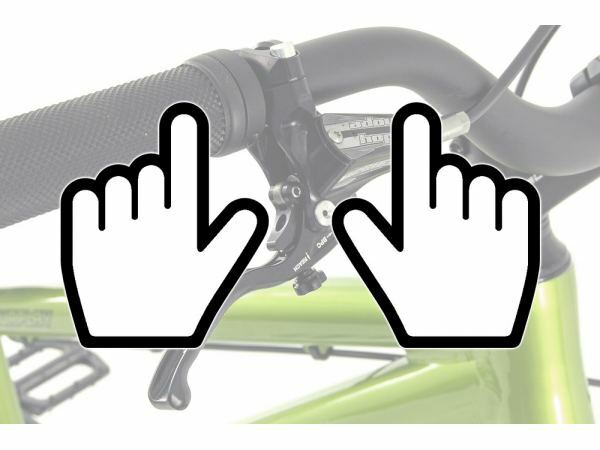 The brake lever "reach" is the most easily solved: on the side of the lever body between the pivot and the barrel adjuster there is a small grub-screw. Screwing this in will cause the lever blade's resting position to be closer to the handlebar. As for cutting handlebars - this is entirely possible and not uncommon. Just be sure to smooth the edges off so it doesn't cut through the grips, or even potentially injure the rider. It's also a good idea to cut too little off so that you can cut a bit more, rather than accidentally cutting too much off and being stuck at that width or buying a new set. Finally, using a smaller stem is also absolutely fine. It is hard for us to advise on which you could use as we don't know how small the intended rider is. If you send us an email with a bit more detail we'll be better able to help you out there. Thanks, Flipp. Hi! I live in Norway and my question is; how much does it cost to send it to the Oslo- area(Norway)? Hi Elek - if you add the items you want to order to your basket and go to the checkout, you can calculate postage costs without committing to placing the order. Thanks, Flipp. Why does this bike (a 20") weigh as much as the Onza Zoot (a 24")? It seems to me like this should be lighter, but maybe I'm missing something. Hi Brandon - thanks for your question. It's just the way it goes, unfortunately. One of the easiest ways to bump weight up is in the tyres. The Tyres on this bike are relatively heavy, whereas the Zoot's are reasonably light. The frame also uses slightly thicker gauge tubing for strength, but at the cost of being heavier. Hope that helps. Thanks, Flipp. Hi Daniel - thanks for your question. Any V-Brake Booster with the right width spacing will fit this bike if you're using the V-Brakes that came with it. Unfortunately the only V-Brake booster we currently stock is too narrow for this bike, so you would have to look elsewhere. Thanks, Flipp. Hi Calum - thanks for your question. How old is this bike? Unfortunately, the only thing for it is to get some new bars. They are not really a component you can "mend". Bending them back will weaken them, and it would also be incredibly difficult to return them to just the right position. Thanks, Flipp. Does this bike have sealed rear hubs for 2013? 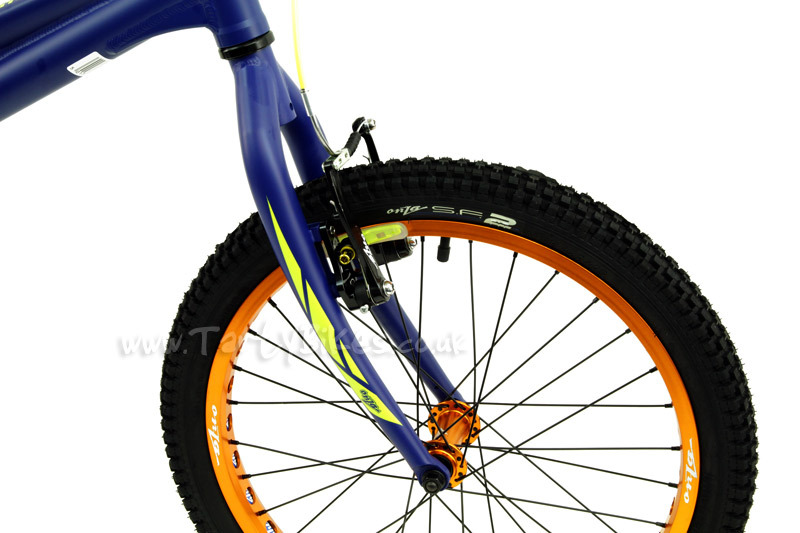 Hi Brian, This bike features open hub bearings. Thanks, Flipp. hi can you fit some Avid BB5 G2CS (160mm) on for me?? Hi i just got this bike for christmas today and when i pull my brakes they just make a massive squeak for how long i pull them for! how can i stop the squeaking noises? Hey, how much should i pump my wheels up to prevent them popping as much? Angus. hi im getting the onza ska for xmas and i was wonderind if it has hose mponts along the frame ? Which is better on the rear Freewheel an 18T or 12T ? Hi, when you get the Onza ska, Could you put the remaining parts on the bike with the TratyBikes Multi-Tool ? Hi can rear hydraulic discs be fitted to this bike? Thanks. Hi Bruce - The Ska frame has no disc mount, so I'm afraid it'd be impossible to fit a rear disc. Sorry! Hi, I was just wondering if the Onza ska's freewheel or Freewheels make the clicking noise when you ride it ? Can an ISIS splined Bottom bracket be fitted to this bike ? 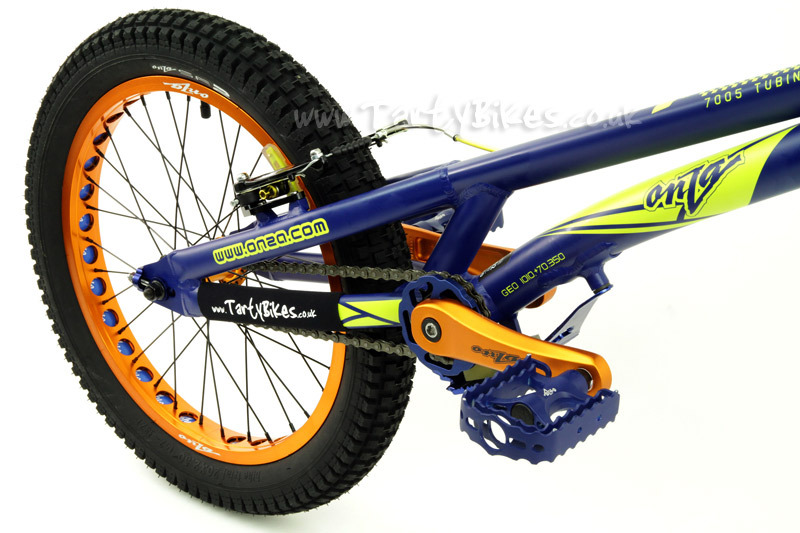 would this bike be a better starter trials bike than the onza zoot. Hello, apologies if you have been asked this question a thousand times before, but I was wondering whether or not this bike would be suitable for my build. I am around 5ft9 and about 10 and a half stone. would the size of this bike's frame accommodate me well? I've had a look around for the information for a while but can't seem to get a solid answer. My only concern is buying a frame this size and it being too small! Thank you for your time. hello just wondering if you can put hydrolic rim brakes on this bike?? How long till the bike is in stock? 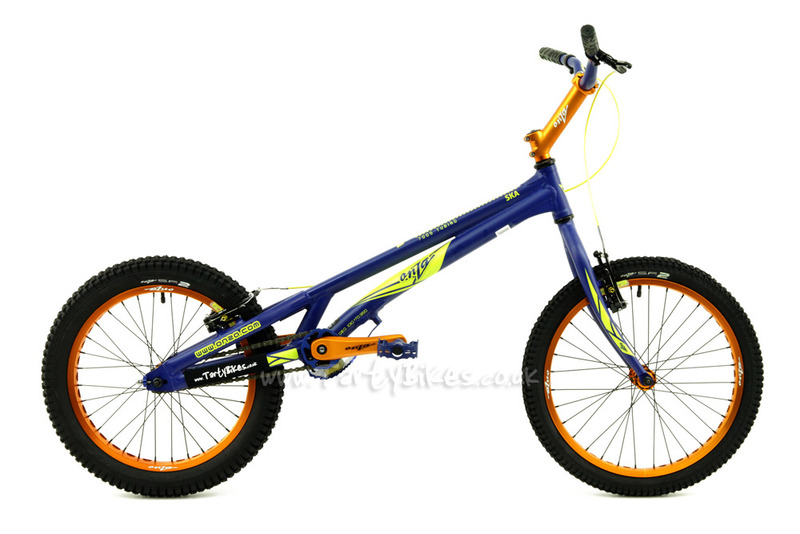 I was going to get the onza zoot 2010 but they've stopped selling it for the price i had so Im getting this my question is when riding this bike what gear would the pedaling be if it was a mountain bike? What kind of pedals are they. is the sproket the same size as the onza pro ?? are these brakes good and is this a good bike ?? Does the bike come all ready to go or will I have to put it together my self? Is the bottom bracket ISIS or square taper? Can you fit Magura HS33's on this bike? I wasn't sure whether trials is something I would enjoy so I didn't want to spend too much on a bike. Since neither used bikes nor any trials riders are in my area I bought this. Now after 1 month I still feel like this bike is highly capable and all components are strong and well crafted. The brakes tend to squeek a lot but only while slowing down. When you lock a wheel they don't make any noise. The only thing I changed are the pedals because I'm much more used to flat pedals opposed to the cagepedals which were installed. In the near future I will change the grips as well but this is (just like pedalchoice) up to personal preference. Overall this bike has probably the highest quality compared to its price out of all my bikes. Hi Alexander - Thanks very much for your detailed review. It's great to hear you're getting on well with your new bike! I hope you continue to enjoy riding it. First of all I have to say that customer service is just fantastic. First buy at Tartybikes, but i had questions and concerns. They were all solved inmediately by the staff and made me feel like the closest of friends. Paid on monday and the bike arrived next thursday on my doorstep. (customs cleared). Wow all the way to Guatemala, impressive. Much easier, faster and cheaper than buying from my northern neighbors. Still have to ride the bike a little bit more but definitely its a bang for the buck, great performance overall (in par with bikes double its price) and great potential. Looks better in person. Hi Sergio - thanks for such a positive review! We try very hard to provide the best service possible, and it sounds as if we get it right at least some of the time! We hope you enjoy the bike, and are always here to help out if you have any issues with it. Thanks, Flipp. Hello - It's good to hear you're getting on well with your new bike! I hope you have a great time riding it. Thanks for the review! this is my first trials bike and it was very humbling at first but as skills improve its is alot of fun. I cant wait to get another one! Thank you guys! This bike is great, affordable and fun. Hi Lisa - Glad you enjoy the bike, thanks for the review!